This industrial ground lease is for a manufacturing operation. The tenant is required to get the landlord's approval for improvements to the property, and retains title to them until the expiration of the term. If the tenant fails to remove them, they vest in the landlord. A. Landlord is the fee owner of that certain real property containing approximately _________ acres located in _________________ (the "Property") shown on that certain plat of survey dated ______________ , prepared by ________________ , entitled ___________________ attached hereto as EXHIBIT A (the "Survey"). 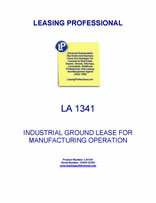 B. Landlord desires to lease the Property to Tenant for Tenant’s industrial business. C. Tenant intends to operate Tenant’s manufacturing business on the Property, which consists of the manufacturing and storage of _____________ and related products. D. Landlord and Tenant desire to specify the terms and conditions of the lease (the “Lease”) shall be as set forth below. 1. PREMISES. Landlord leases and demises to Tenant and Tenant takes and leases from Landlord, on an exclusive basis, that certain real property, as shown on the Survey containing approximately ___________ acres, together with full and complete legal and physical access by means of existing roads and rights of way on a 24 hours per day, seven days per week basis and all appurtenances, rights, privileges and easements thereto (the "Premises"). 2. PURPOSE. Tenant shall have the right to use and occupy the Premises for the manufacture and storage of ______________ and related products and related uses and for no other purpose. (d) To the knowledge of Landlord, there is no litigation or other proceeding currently pending or threatened against Landlord or any owner, stockholder, partner or affiliate of Landlord or the Property which could adversely affect Landlord's ability to perform any of Landlord's obligations hereunder or Tenant's rights hereunder. 4. TERM. The term of this Lease shall be twenty (20) years, and shall commence on the date hereof (the "Commencement Date") and shall expire at midnight on the day preceding the twentieth anniversary of the Commencement Date (subject to the renewal rights described below) (the "Expiration Date") Tenant shall have the right to extend this Lease (the "Renewal Option"), on the same terms and rental set forth herein, for two additional terms of ten (10) years each (the "Renewal Lease Terms"), provided, however, such Renewal Option is contingent upon the following: (i) there is no Event of Default by Tenant at the time Tenant gives Landlord written notice of Tenant's intention to exercise the Renewal Option; and (ii) upon the Expiration Date or the expiration of any Renewal Lease Term, there is no Event of Default by Tenant. Tenant shall exercise each Renewal Option by giving Landlord written notice at least sixty (60) days prior to the Expiration Date or the last day of any Renewal Lease Term. If Tenant fails to give such notice to Landlord prior to said sixty-day period, then Tenant shall forfeit the Renewal Option. If Tenant exercises the Renewal Option, then during any such Renewal Lease Term, Landlord and Tenant's respective rights, duties and obligations shall be governed by the terms and conditions of the Lease. All references in this Lease to the term "Term" shall include any renewals thereof. 5. BASE RENT. Tenant covenants and agrees to pay to Landlord, without prior demand, rent in the total annual sum of _______________ ($__________), payable in monthly installments of ______________ ($___________) each (the "Base Rent"). Base Rent for the first month shall be due on the Commencement Date. Base Rent for each month thereafter shall be due on the first day of each month. If the Commencement Date is on any day other than on the first day of the month, Base Rent for the first month shall be prorated according to the number of days during which the Tenant will occupy the Premises during such month. If the Term ends on a day other than the last day of a calendar month, Base Rent for the last month shall be prorated according to the total number of days during which the Tenant will occupy the Premises during such month. Rent shall be adjusted as of each anniversary date of this Lease. The increase in Rent each year shall be __________ (__%) percent based upon the Rent for the previous year. In the event that Tenant shall fail to pay any Base Rent within ten (10) days of the date when the same shall become due, Tenant shall be obligated to pay Landlord a late charge of five percent (5%) of the amount of any past due payment in addition to the payment then due, which late charge shall also be considered as Base Rent until paid. 6. OTHER COSTS. This Lease is an absolute net lease, which the parties intend to yield net to Landlord the rental provided for above. Tenant will pay all costs, expenses, and charges of every kind and nature relating to the Premises and improvements on it that may arise or become due during the Term. Tenant covenants to pay, among other things, all personal property taxes and assessments, sales, use and occupancy taxes, water and sewer rates, rents and charges, charges for public and private utilities, fees for governmental approvals, and all other governmental charges and fees (general and special, ordinary and extraordinary, foreseen and unforeseen, of any kind and nature whatsoever) that may, during the Term, be imposed on, payable with respect to, or become a lien on the Premises, any present or future structural improvements or its appurtenances. In addition, Tenant covenants to pay to Landlord, its pro rata share of all real estate and similar taxes and assessments (including assessment for local or municipal improvements) levied on the land of the Property, as determined by dividing the acreage of the Premises by the acreage of the Property and multiplying the quotient by the total tax levied on the Property. Tenant's pro rata share is initially set at ____%. Tenant and Landlord shall work in good faith to determine an allocation between the parties (prior to the commencement of this Lease and from time to time as applicable) regarding real estate and similar taxes and assessment based on the improvements owned and/or operated by each party which are located on the Premises and elsewhere on the Property. Notwithstanding anything contained herein to the contrary, Tenant shall not be responsible for any kind or type of cost, expense or charge that does not relate to the Premises or Tenant's use of the Premises, including without limitation, any cost, expense or charge relating to the remainder of the Property, such as taxes, costs, expenses, or fees relating to improvements not located on the Premises or penalty and/or interest due to Landlord's late payment of same. Tenant may, at Tenant's expense, contest, in good faith, any such tax, or assessment or other governmental charge or other cost set forth in this Section; provided, that pending the outcome of such contest, Tenant shall make any payments required by this Section. Landlord agrees to reasonably cooperate with Tenant's efforts in each such contest. 7. QUIET ENJOYMENT. Tenant, upon observing and keeping all covenants, agreements and conditions of this Lease on Tenant's part to be kept and observed, shall quietly have and enjoy the Premises throughout the Term (as the same may be extended), without hindrance or interference by Landlord or by anyone claiming by, from, through or under Landlord. 8. MAINTENANCE. During the Term of this Lease, Tenant covenants, at Tenant's cost and expense, (i) to substantially repair, maintain, amend and keep the Premises and all improvements now existing or hereafter built on the Premises in generally in good order and condition, except that Tenant shall have the right, in accordance with all applicable laws and regulations, to idle and mothball any tanks or equipment that it deems to be uneconomic to further maintain, and (ii) to keep the access roads, rights-of-way and pavement located on and serving the Premises free from snow and ice, maintain the parking areas located on and serving the Premises and perform all weeding, trimming, pruning, watering and mowing of grass and landscaped areas located on the Premises Landlord shall, at Landlord's cost and expense, repair and maintain all other access roads, rights of way and pavement located on the remainder of the Property (excluding the Premises) in good order and condition and free from snow and ice and shall maintain parking areas and curbing located on the remainder of the Property and perform all weeding, trimming, pruning, watering and mowing of grass and landscaped areas located on the remainder of the Property.